This review of Tineacide Athlete’s Foot Cream is to help potential customers make an informed decision when it comes to buying products to treat foot fungus related problems. 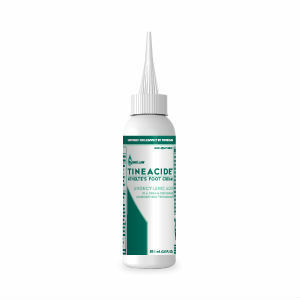 Tineacide Athlete’s Foot Cream claims to treat Tinea corporis, Tinea pedis and Tinea cruris. It is available on shopping websites but not on the product’s website. Read on to know more about whether this product is a good buy and how it works to treat the infection. Although no ingredients have been mentioned on the product’s website, the list has been taken from another shopping website. No directions on how to use this product were found on the manufacturer’s website but one should wash the affected area with soap and water and dry thoroughly before applying. For athlete’s foot: apply to the affected skin between and around the toes twice a day for 4 weeks in the morning and night, or as directed by a physician. This product is not effective on the scalp or nails. Wear well fitting, ventilated shoes. Change shoes and socks at least once daily. For jock itch and ringworm apply twice daily to the affected skin for 2 weeks or as directed by a physician. Wash your hands after each use. Nothing has been mentioned on the product’s website, but the cream is for external use only. Do not use in or near the mouth or the eyes. If contact with the eye occurs, rinse thoroughly with water. This product should not be used for vaginal yeast infections. Stop use and consult a physician if any irritation occurs or if there is no improvement within 4 weeks (for athlete’s foot or ringworm) or within 2 weeks (for jock itch). Keep out of the reach of children. If swallowed, get medical help or contact a Poison Control Center right away. The cost of the product is $15.97. The price is mentioned on other shopping websites and not on the product’s website. There is no guarantee offered by the manufacturer regarding the product. The product’s website only includes a few sentences that introduce the cream. The customer reviews found on other shopping websites are mixed. For some, the product has worked, while for others it hasn’t at all and has left them dissatisfied. Tineacide Athlete’s Foot Cream has reviews which are mixed as some have seen excellent results while for some it hasn’t worked at all. However, there is no manufacturer’s guarantee available on the product’s website, there are no specifications given on how to use the cream given on the product’s website nor is there any list of ingredients mentioned on the product’s website except for Undecylenic Acid (25%) which is mentioned as being used to treat the athlete’s foot. The bottom line is that the product should only be used after consulting a doctor to avoid any reactions from the given ingredients. Jimmy Rodriguez	reviewed Tineacide Athlete’s Foot Cream	on November 19th	 and gave it a rating of 2.5.